We interrupt our adventures in lifted arithmetic optimization for a brief public service announcement on behalf of my little friend to the left there. (Click on the image for a larger version.) I took this photo at my home in Seattle this past Sunday, before I flew down to San Francisco for training at Coverity’s head office. (And it took a number of attempts to freeze the wings, even at 1/640th of a second shutter speed with my Canon DSLR.) 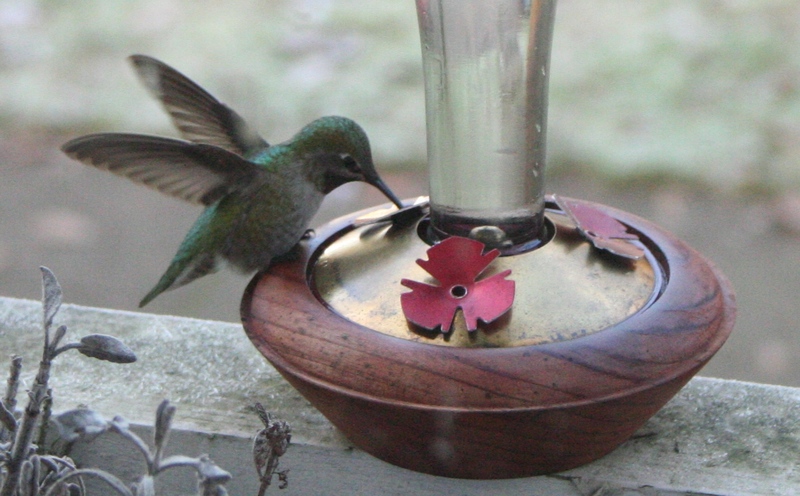 Amazingly enough, male Anna’s Hummingbirds like my friend there will spend winters in Seattle. At the time this photo was taken it was well below freezing. Apparently more and more male hummingbirds are staying in Seattle over the winter, as climate change makes the winters here slightly more survivable; even Rufous and Allen’s hummingbirds are being observed. They migrate out of the hills to the warmer lowlands, but don’t go farther. Hummingbirds are always within mere moments of starving to death and in the Seattle winter there are far fewer sources of food than other times of the year. (Anna’s Hummingbirds are unusual in that they can eat bugs while in flight, which does help.) If you’ve got hummingbirds coming to a feeder, keep it stocked. Take it in at night; I found my feeder frozen solid and a very vexed hummingbird trying in vain to feed one morning. A number of people have asked me where they can get my feeder; you can find it here. You’ll notice that in my feeder the liquid is clear and colourless. It is one part sugar to three or four parts water, and that’s it. Stores will try to sell you hummingbird food at enormously inflated prices, but what they’re selling is sugar mixed with red dye. The red dye does nothing to attract the birds, and it is bad for them. Their little kidneys have to remove the dye from their bloodstream. I’m in California again next week, but I’ve queued up a couple of articles to go out while I’m away. Have a great weekend, and tune in Monday for the final episode in my excessively long series on lifted arithmetic optimization. This entry was posted in Non-computer and tagged hummingbird, public service announcement by ericlippert. Bookmark the permalink. Here in Texas we only get them migrating to/from Mexico for the winter. We keep the feeder up until we don’t get any traffic for a week or so and then take the feeder down until spring. I don’t know if they would be staying up in WA because of climate change (like you said – it gets below freezing). They could be staying up there because people leave bird feeders all winter out for the birds. Climate change seems like the last reason they would be staying up there. Don’t forget that climate change affects both the Seattle environment and the Mexican environment that they are migrating to. We already know that it is adaptive for males to migrate less than females; it might be that this characteristic is even more adaptive in a warmer, wetter Seattle and a hotter, drier Mexico. My dear friend Michelle is fortunate enough to have highly communicative hummingbirds who will stare her down through her sliding glass door when their feeder is empty and/or frozen. If she fails to respond in a timely fashion, they wil resort to beating their wings up against the glass and engaging in what can only be described as a frenetic “FEED ME, WOMAN! !” dance. I personally have not witnessed this phenomenon but her description of it was enough to render me non-functional. Somewhat off-topic, but in a similar vein, a co-worker of mine once told the story of oiling his bird feeder so that the squirrels would fall off when they tried to get to the food inside. That is kind of funny on it’s own, but the best one was when he told about how a rabbit came by to enjoy some of the leftover mess the birds left on the ground and was ambushed by a squirrel who slipped off the feeder. He described the fight that ensued as “squirrel karate” because the rabbit’s defense mechanism of choice was to jump straight up and down, presumably in a panicked attempt to scare the squirrel, while the squirrel slapped the rabbit in the face each time he came down. I was not witness to this myself, but I decided it was funny enough that I didn’t care if there was some embellishment.